Bring in your new arrival or small person and create a unique, personalised memento to cherish forever. 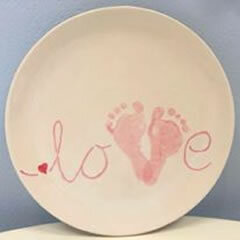 With the help of our friendly staff, capture your baby's tiny toes, from newborn, on a ceramic of your choice - a picture frame, plate, tile, plaque, mug or anything or your choice and then add your little one's name, birth date, weight, time of arrival - whatever you like. Hand prints are great too however these are better from about 10 months. These also make great gifts for family, Godparents and friends. You can be very creative in making your baby's footprint into a picture - a tractor, racing car, bird, flowers, butterfly, sea creature and Rudolph and "Mistle-toes" at Christmas to make that special gift or keepsake. Handprints or fingerprints can also be used effectively for a variety of occasions. Maybe you are looking for an idea when a teacher is leaving? A plate with the fingerprint of each child in the class, or a drawing, alongside their name can make for a wonderful gift that 'sir' or 'miss' will treasure for years to come or the whole class can create something together for their teacher. Please contact us for suggestions. There are certain colours that are better for hand and foot prints as you need enough pigment that it will show with just one coat but not so much that we can't wipe it off and start again if the print is unsuccessful. We can advise on colours when we do the prints. Please do not expect perfection with hand and footprints - your little ones can be very wriggly and it's amazing how stubborn the toes of a newborn baby can be! We don't recommend hand prints under the age of about 10 months as young babies naturally have clenched fists - it is difficult to get an even coverage of paint and I am not happy to prise open tiny fingers. We are happy to support you if you wish to try though and it does work more successfully if they are asleep! If you wish to make tiles that will need to be mounted and grouted, for behind the basin in your bathroom for example, please let us know when you paint them so that we know not to glaze the back as they adhere more effectly unglazed. We love to have baby groups come into Jars of Clay and it is a lovely thing to do together. 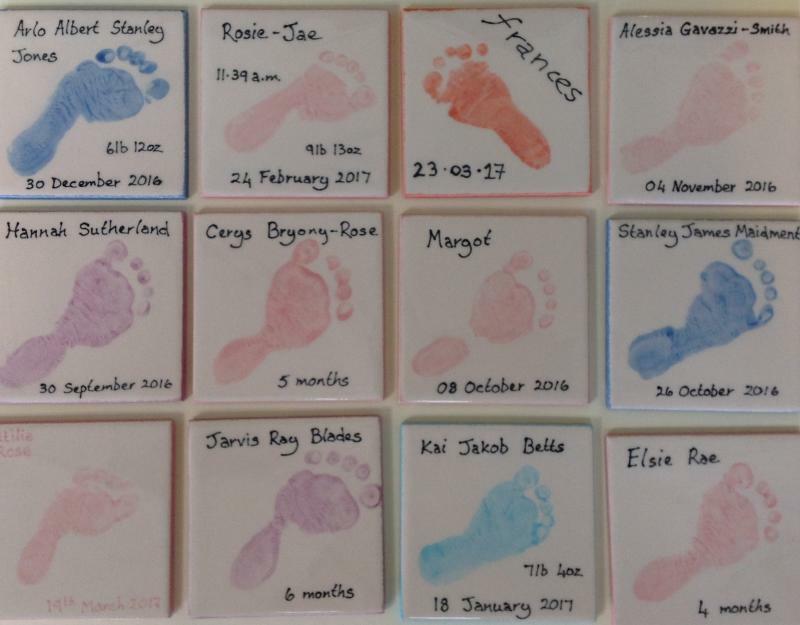 If you want to come as a group to paint your babies footprints on ceramics please ring and book as we need to ensure that enough staff are on hand to be able to give you sufficient attention to paint feet and keep you supplied with refreshments. Jars of Clay is a relaxed place to come with your newborns; we are always happy for you to stay awhile and you are very welcome to breastfeed your baby here. Remember that you don't need to paint to come to us; you can use us as a comfortable and welcoming meeting and catch-up place for your post-natal or baby group. Baby-changing facilities are also available for your convenience. 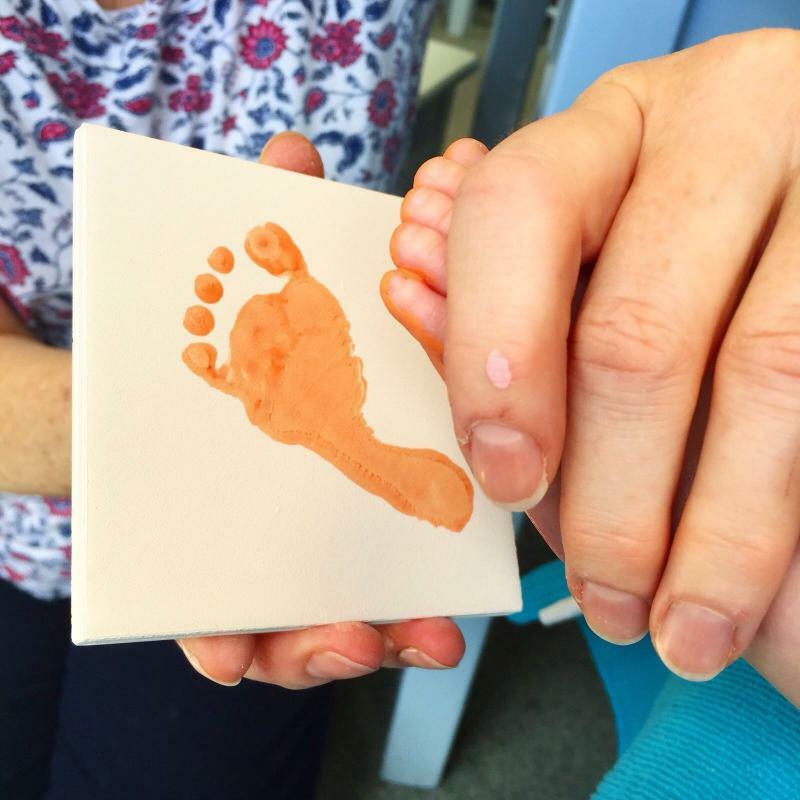 We are offering one free footprint tile for any baby less than six months old.